If you would like to know how to join the reality game show Fear Factor Philippine edition which will be aired on ABS-CBN these next months, then please read on. Have fun and have no fear. Pinoy Fear Factor. I thought that was funny for two reasons, the first being that I don't LIVE in the Philippines, but more importantly that there even IS a Fear Factor Philippines. Having a show like this in a country whose own regional cuisine was made into a challenge on the original Fear Factor is going to be really weird. 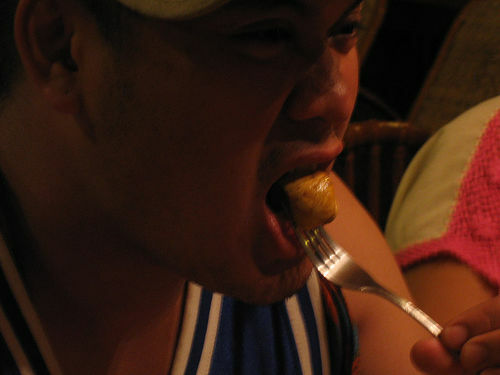 Everyone remembers the episode that featured the challenge where contestants had to eat 'BALUT' (or "ba-LOOOT" as they called it). In fact, this is one of Fear Factor's most memorable challenges, as documented on the NBC website. Which brings me back to the Fear Factor Philippines thing. I still ask, what in the world kind of challenges do you give contestants from the country that created the eating of 24-day duck embryos? Don't we already win the money each and every time we eat a balut (or sisig, or dinuguan, or crispy pata or chicken intestine)? Really.... what will this show look like? 1. Smell the Shirt, Guess the Ulam - Is it Lumpia smell? Bangus? Or is it just Fried Garlic? 2. Agree on a time and arrive to the Finish Line less than an hour late - I am highly doubtful there will be any winners of this one. 3. Drive a vehicle onto a moving tractor trailer - This is the same as the one in the original Fear Factor, but you're driving a Dodge Caravan with custom curtains, your deadbeat TNT uncle and his 3 kids in the back and there's a huge sticker on the top of the windshield that says "Tamaraw". 4. Bring Ba-on to the Movie Theatre, Evade Security - **as heard in your headset** "OK... in 5, 4, 3, 2, 1!!! Pop the home-brought can of Coke NOW!!!!!! There's Security! TAKBO!!!!" 5. Eat White People Food -- Asparagus, Brussel Sprouts, Turkey with Cranberry Sauce, Chicken Fingers - all with Heinz Ketchup. BLECH.